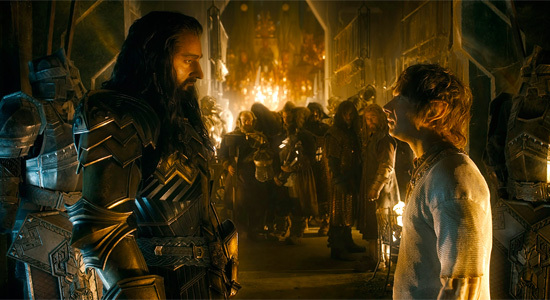 When we last left Bilbo (Martin Freeman), the Dwarf-who-would-be-King Thorin Oakenshield (Richard Armitage), and his merry band of Dwarf companions, they were watching a horrific scene. The vicious dragon Smaug (voice by Benedict Cumberbatch) had just broken from the Lonely Mountain to lay waste to the nearby Laketown and its human residents. Among them, Bard the Bowman (Luke Evans), an archer who may be the only inhabitant of Laketown with the skills to stand up to the sadistic beast. Meanwhile, Thorin ventures deeper into the Lonely Mountain the Dwarves have now claimed for their own, and the destiny for the King under the Mountain is about to face and immediate and ultimate challenge. That alone seems story enough to fill a Jackson-sized adventure and would seem the natural course of direction from where he left us off with the previous episode, The Desolation of Smaug. Unfortunately the conclusion to the story of Smaug and his siege on Laketown is brushed over rather quickly in this film, only the first 10-15 minutes devoted to clearing up the gigantic threat left open at the end of the previous film. It's just the first of a long thread of missed opportunity and untapped potential this third and final film could have aimed for. What was built up as the ultimate antagonist through two films is quickly discarded for Jackson's real main attraction this time around, that epic battle between five nations over control of the Mountain. While that seems like a good enough focus point for any motion picture of this size, Jackson's handling of the event seems just as brushed over as the fight with the dragon. 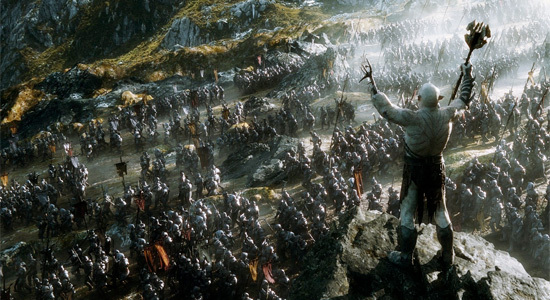 The Battle of the Five Armies comes across more as an epilogue for the two films that came before it than anything else. From the opening moments it all feels like its head down Wrap Up Lane by way of Deus Ex Machina Boulevard. Not that Jackson - and J.R.R. Tolkien, for that matter - have issues using Deus Ex Machina to worm their characters out of seemingly impossible situations. That's about par for the course when it comes to Bilbo or Frodo and their merry adventures through Middle Earth. That's nothing new, to be sure, but the amount of time Jackson has given to this battle deserves more of a sense of culmination than it's given. This should be the grandest of all the grand spectacles Jackson has given us since The Fellowship of the Ring was released 13 years ago, a momentous achievement in visual effects and epic design. Instead it's a deflated afterthought of CG set pieces and endless hand-to-hand fights. There's never much of an idea of strategy from any of the five armies, no notion of back-and-forth within the battle that might create even an iota of suspense. It's thousands of CG-rendered creatures swiping weapons at thousands of differently-colored CG creatures. Jackson and his team of visual effects artists provide a handful of impressive moments in The Battle of the Five Armies, most of these coming when the film decides to focus on smaller battles. Naturally Orlando Bloom returns as Legolas, who never seems to be able to fight anyone on the steady ground. All the creativity behind stunt work and keen fighting skills seems to go his direction in these films. Early on we get a fight involving the wizard Saruman (Christopher Lee) and the Elven lord Elrond (Hugo Weaving). While it's great seeing these two veterans of the series showing off their hand-to-hand stylings, it goes by too quickly, the end results seemingly having no bearing on the giant battle going on elsewhere. More than anything it makes you excited for the potential of a fighting game featuring characters from Middle Earth, but that may be more my personal desire to play as Christopher Lee in a video game. What little drama The Battle of the Five Armies offers is standard, predictable, and all-around blasé save for the emotional execution provided by Freeman. Once again he proves his worth to this series giving Bilbo the perfect idea of the reluctant hero. He isn't given much to do here, but the time or two he's required for dramatic effect are made all the more notable because of his presence. Beyond his performance the acting here is suitable if not a little forgettable, but that's due to how little there is going on. Evangeline Lilly returns as Tauriel, an Elf who has feelings for the Dwarf Kili, played by Aidan Turner. All the development in that storyline came in The Desolation of Smaug, so there's nothing for them to do here but wrap it up. Ian McKellen makes his obligated return as Gandalf, but what the character offered to the battle within I'm hard-pressed to call to mind. That's generally where The Battle of the Five Armies stands on its own. Other than a requirement for ending Jackson's take on The Hobbit, there's really no purpose for any of it. Perhaps when viewed as a complete saga - as many are sure to do for years to come - this ultimate action extravaganza will be taken in as more an epic denouement of a larger tale. Perhaps the end of The Battle of the Five Armies slides effortlessly into the Lord of the Rings saga that's intended to directly follow. Viewed on its own, though, it's hard not to see this film as a director going through the motions to reach an inevitable conclusion. Whatever the case may be, it's time to be thankful we're all done with Middle Earth… for now. I don't think it was 13 years of anticipation. its a money machine hollywood and the movies suffer from it! I've already sketched out a lot of notes so that I can edit the three films into two. And I'm probably not the only one with the idea of making a 2-film fan cut, so your wish might come true. The only question will be which fan to trust. Seriously, ever since "The Fellowship of The Ring", Peter Jackson's movies have been filled with way-too-long scenes that should have been edited down by minutes....the barrel scene in "Smaug" and the Skull Island dino stampede scene in "King Kong" come to mind. Love both of those scenes. Im sure it looks great! Feel exactly the same about the Hunger games Mockingjay, the first one felt like a good first half of a film stretched beyond belief. Dammit hollywood. Three movies and nowhere close to the book. WHY ARE YOU GUYS ALWAYS SO NEGATIVE LIKE EVERYONE ELSE. Sheesh. There isn't any pleasing you, is there? I always make it a point to view the film and make up my own mind - which is just as well, considering what you have written here. A good thing PJ makes these films for the fans of his work and not for others. The wonderful thing is that you don't have to watch any of them - leave that for us to do - over and over again! Stale, and predictable... it's called a book dim wit.